Next stop on the tour of the (old) new house is the heart of the home - the kitchen. This kitchen is nothing compared to the awesomeness that we had in York, but it is everything compared to the apartment we just came from. 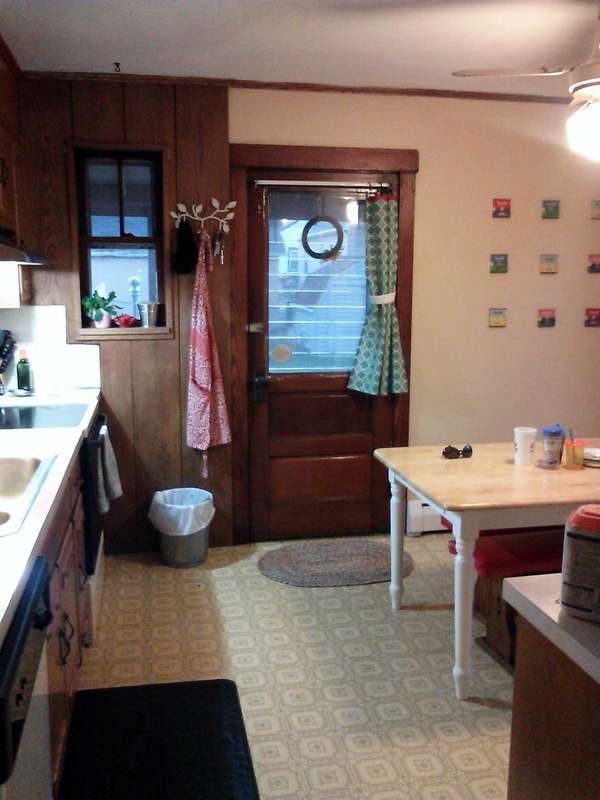 When I walked into this eat-in style boxy kitchen and saw the dishwasher, four windows, and pantry cabinet, I was sold. This is the view from the living room. To the right is a wall of cabinets, including the refrigerator, pantry, and a "command center." 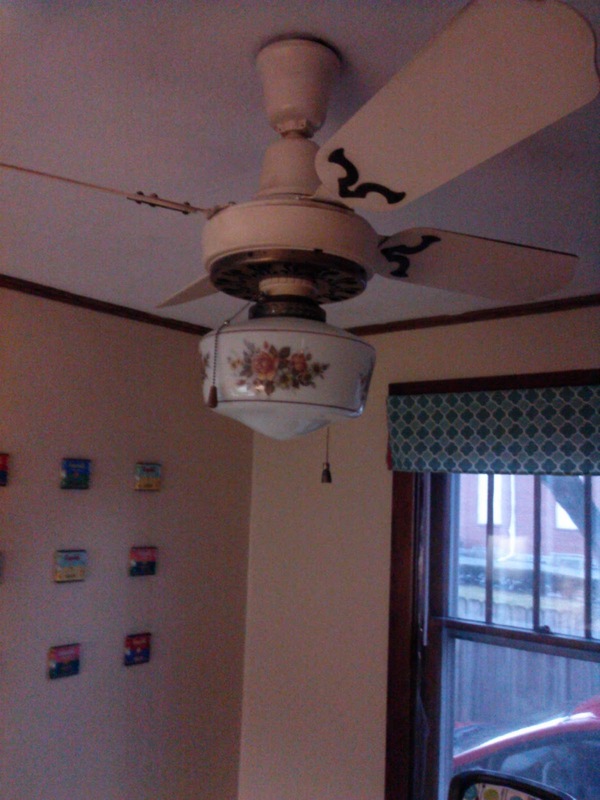 Unfortunately, those great features were also accompanied by some completely retro (and not in a cool way) flooring, ceiling fan, and paneling. 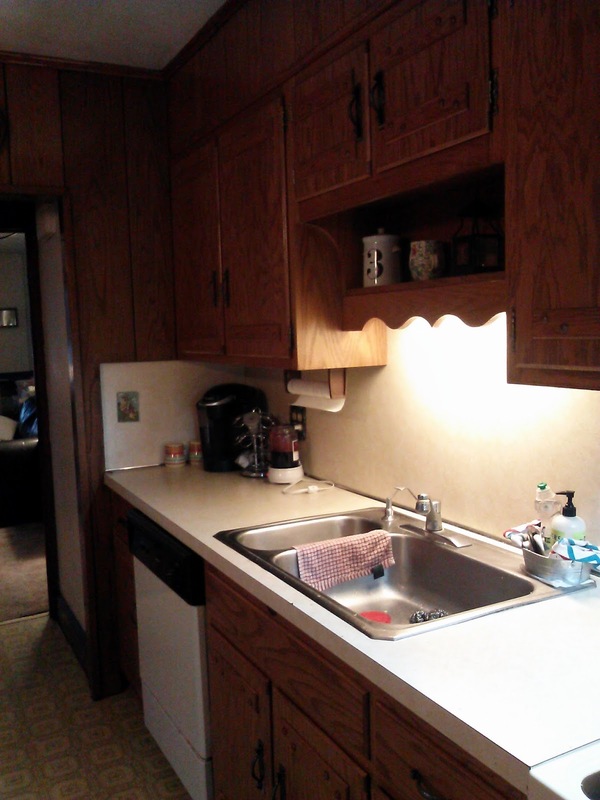 Between the wood cabinets, paneled wall, and wood trim, well, let's just say sometimes it feels like I'm on a boat. Oh extra counter space, how I love you. Let me count the ways. One. Yep, this does it for me... this bigger kitchen allows me a helper and this guy is the best. He sets tables, throws away trash, puts away plastic cups and silverware, and gives things an extra stir. But mostly he keeps me company and asks, "Did you make that?" in the sweetest little voice, followed by, "I like it." Two. Three. This kitchen has room for us to be a family. Exhibit A. 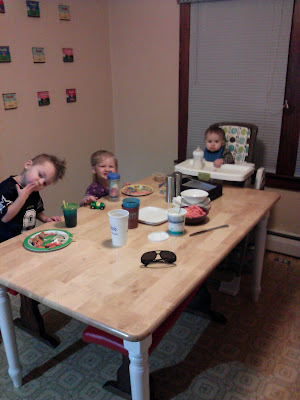 My son, niece, and nephew chillaxing at dinner the other night. So, that's my kitchen. I can't seem to find the pictures I took of the other wall that shows the command center and fridge, but if you come over and visit, I'll pull something out of the fridge to feed you. You can look at it then. Did you catch my little Campbell's Soup Andy Warhol art work there in the corner? 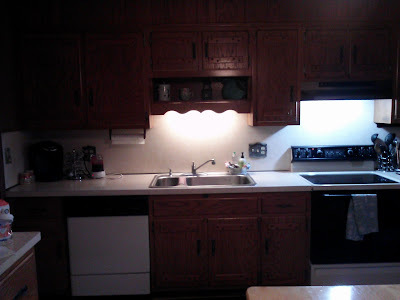 It was the first of several kitchen projects I want to do. I picked up 9 cans of the limited edition soup at Target a few months ago, then modge podged the labels on to 4"x4" canvases. The complete project rang in around $30 which is a little pricey for me, but it fits PERFECT into the color scheme I love (anything based on my fiesta ware). That's my Christmas morning table setting that I spent WAY too long arranging. 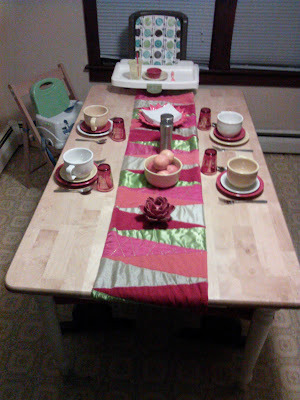 I love having many colors of plates though, it's really fun to try differing combinations. Other projects up my sleeve for the kitchen? Do something about the mis-matched benches and table. 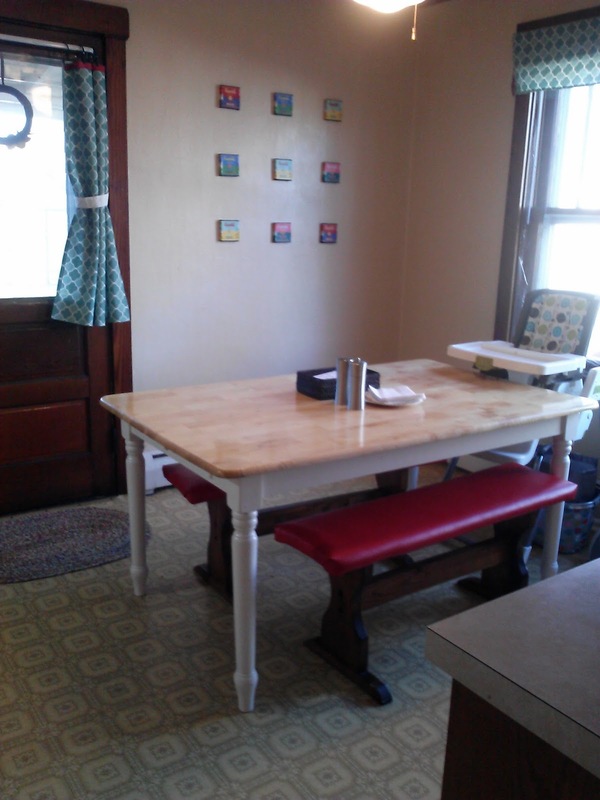 Re-stain the table top or paint the benches white (I'm thinking the latter). 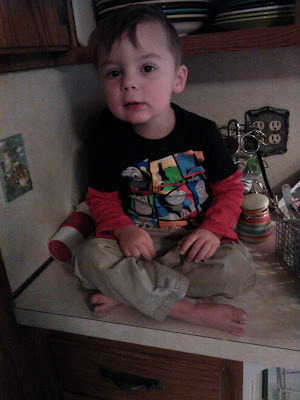 Levi is almost done with his high chair, so soon that will free up 4 square feet of space, too. I'd also like to do something more with the window treatments on the door and windows. I started to let my daughter outside in a fenced, clean, hazard less backyard at 2.5 as long as I was doing whatever I was doing near a window or door.